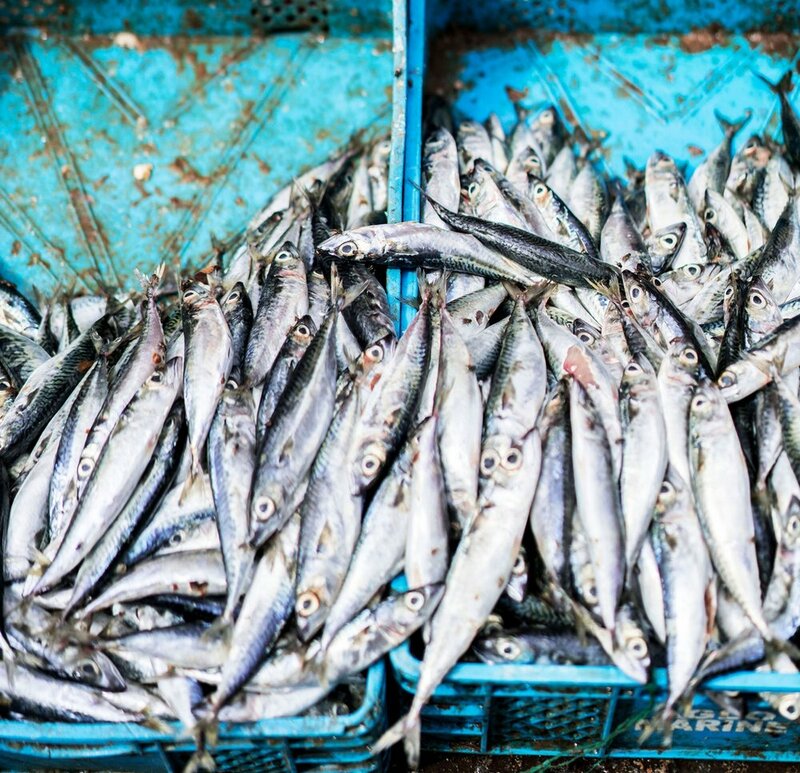 After my trip to Marrakech with my Moroccan travel buddies Andrew and Nipon earlier this year, and our over enthusiasm in trying to get to the Blue Pearl – all in one trip, Chef was still on our minds – and that’s even before we left Marrakech airport. In fact, we were probably already planning our return whilst we were on the flight home! 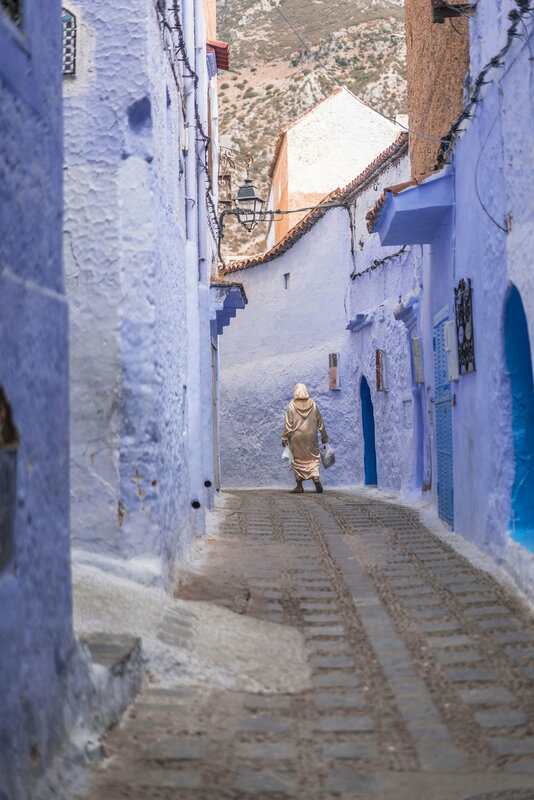 Why Chefchaouen?...well, other than the fact that I want to go everywhere, I sometimes see photos of a place that make me feel inspired, and I want to go see it for myself. Sometimes it’s purely from talking to people, and sometimes I get a place in my head from books I’ve read. I remember the first time I’d heard about this blue city, and from that day on I knew one day I would eventually get there. Getting to Chefchaouen seemed like it was going to be little mission. We’d already discovered that from our grand plan to visit from Marrakech. There’s no easy or fast way of getting to the city, and there are a few options of where you could fly into…. we looked at flying into Tangier, Fez and even flying to Gibraltar and getting the ferry across. But, we settled on Fez because we all decided that the city looked interesting to capture with our cameras. It has the largest Medina in Morocco, and we thought Marrakech was large and maze like…this felt like it could be a challenge. Our plan was: Fly into Fez – head straight to Chefchaouen for the night – and then head straight back to Fez after sunset We were hoping to add on another day, but flights-wise, we were kinda restricted, so it was going to be a short and sweet trip. We also were hoping to squeeze in a trip into the desert, and thinking about it, I’m glad that didn’t work out, as I think that would have struggled to see everything. I already thought our time was stretched, as I like to take my time, wander and get a feel for my surroundings. I wanted to experience as much as I could in these two cities, and not waste a single moment. Once again, Nipon was placed in charge of sorting out our Airbnb, and he didn’t disappoint. Casa La Hiba was perfect. It was once a family home, belonging to the grandmother of our host Mourad, who was such a lovely amiable guy. He even promised us a driver who would pick us up from Fez airport. It’s over a four-hour drive, so that’s a fair bit of intense driving in the heat. And, our driver Taha was the best! He greeted us with the biggest smile which rarely left his face, and proceeded to lead us towards a BMW. The three of us spotted this nodded a knowing look of approval, like we’d struck gold…and then he continued walking to a rather more modest dusty vehicle, which we found rather amusing. Anyway, Taha was possibly the best driver. He never looked fed up or cross throughout the drive, and it was hot and sticky that day. He took a shine to our banter, jokes and incessant excitable babble, and gives us lots of little facts throughout our journey. Quickly earning our trust, we filled him up with our car snacks and words of English which he seems to enjoy. Turns out Taha is best mates with Mourad, and we joked with him that the two of them seemed like an old married couple, always on the phone to each other. Some of our funniest moments were our car banter. My favourite has to be Taha’s excitement and enthusiasm at pointing out the mountain that apparently resembles a ‘frog jumping’. Nipon and I for the life of us couldn’t see this ‘frog’ what-so-ever, let alone imagine ‘a frog jumping, Andrew seemed to have more of an imagination that us, and the more we couldn’t see the ‘frog’ the more excited Taha became. I really tried ‘using more of my imagination’ like I was repeatedly told to, but nope...I still couldn’t conjure up a ‘frog jumping’. Bless Taha. Our car ride took us through modern buildings and construction – which is pretty usual, but in between you’ll see glimpses of local life. Sheep in fields, groups of men lazing about in fields or on street pavement talking. Cafés full to bursting with men just sitting in groups or on their own simply just watching the world go by. I love these snippets of daily life. I find them fascinating and so culturally different considering Morocco is just over a couple hours away from the UK. I’m going to try my hardest not to get carried away about each and every moment of this trip. Although, that’s going to be a hard one to contain. 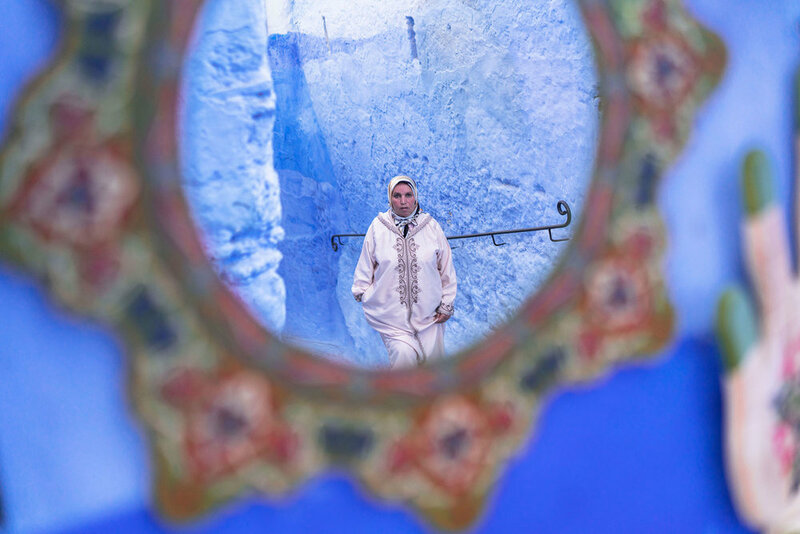 I’d romanticised about Chefchaouen since arriving back from Marrakech. And, our drive, even though it was long, and hot added to the adventure. At the same time, all I wanted to do was to dump my luggage and get out and explore. I wanted to see whether the ‘Blue Pearl’ really lived up to its name. I couldn’t wait to catch my first sight of the city. The approach to Chefchaouen had us excited, and a little anxious. As we wound our way over the hills listening to Taha telling us about his life, we were a little hesitant with our first views as we saw lots of white, and only a little blue. Assured by Taha that the city ‘is very blue’, we continued driving. Like many places in Morocco, the oldest parts of the city are within the city walls, and just like Marrakech, Chefchaouen has an old town and a new one. It’s not until you walk through one of the gates, and start to discover the city on foot that you see how beautifully blue it really is. And yes, it’s very blue. It’s total sensory overload and it’s like walking into a fairy tale. Everyone seems happy too, it’s definitely a feel-good place. The sun had just dipped behind the mountains when we arrived into the city, and feeling a little weary from all the days’ travelling, that evening we headed to a rooftop restaurant where we stuffed ourselves on tasty salads of aubergine, tomato, and the most delicious local cheese which was oh-so good. And, then we called it a night, excited for the next day. And, what a wake up! The first call to prayer echoing across the blue and white rooftops of the city was one of my personal highlights. It brought back the same feelings we had in Marrakech. I laid in bed thinking how incredibly beautiful it sounded, and in that moment, I felt indescribably happy. I was with two friends, and we were going to have a fun day. The sun was shining and we enjoyed breakfast on our rooftop – as well as a hunt for the resident rooftop tortoise. I think I could live on Moroccan breakfasts! The bread is so-so delicious, and the pancakes drizzled with honey is better than what you get at home. After breakfast, Mourad told us that if we wanted to get a good view of the city we should take the steps up the hill ‘there’s not many’, he said…I think Mourad underestimated our fitness. The three of us were left short of breath clambering up a steep hillside and coming face to face with a pack of dogs. The view was a pretty one though, so we didn’t mind. As this was our only day in the city, we knew we had to make the most of every little street and every little moment. We walked Chaouen’s (yep, that’s what the locals call it) medina from top to bottom, came across so many friendly people, shouted out ‘hola ’ to countless others. I found it interesting that the locals speak Spanish here - not so much French - but that’s because the city is so far North, and there’s a huge Spanish influence from when Jewish inhabitants from Spain fled to Morocco during the Reconquista of Spain. We stopped to ‘ooo’ over the cutest cats, got offered hashish, watched children playfully run through the streets with happy smiles, and yes, we got lost in a sea of blue. And, it’s no exaggeration to say that every alleyway and street is majestic. You’ll find that feeling in awe of your surroundings is an impossibility and it’s near on impossible to take a bad photo. Part of the charm lies in the quaint medina. It’s not large, but it’s full of vendors selling something or other. From antiques to woken blankets, leather slippers to brass teapots. And, the old town is super easy to navigate. It’s car free, and really chilled, and totally different compared to the chaos, humidity and stress of other Moroccan towns. Chaouen offers up a more relaxed pace, it’s a feast for the eyes and soul, has fresh mountain air, and the purest spring water. We found ourselves a lovely restaurant where we naturally headed up to the rooftop and refuelled our bellies with tagines - Morocco at its most Moroccan! At that given moment, I think we all wished we were staying for another night – the thought of changing our itinerary did cross our minds, we even checked with Mourad to see if we could stay an extra night….however, Taha was waiting for us. He was taking us up to the Spanish Mosque to watch sunset. We thought he was just going to drop us off and let us make our own way up the hillside, but bless him, he wanted to come with us, and so we all took the short hike. From here, you can look out over the mountains and town. It was a blissful moment of a wonderful day…. And, then the four-hour drive to Fez….